Those who trade stocks, options, futures, or forex need advanced charting to analyze market trends and make informed decisions. The TD Ameritrade thinkorswim platform has the tools needed to meet the needs of even the most experienced trader. It has a variety of tools and features to help beginning traders better understand both how to use the platform and how to improve their trading skills. Some of the best features include Active Trader, Level II quotes, and an OnDemand feature that replays past market sessions in real-time. Plus, improved platform features are regularly rolled out so clients enjoy a cutting-edge trading platform with top notch customer support. Can You Trade Forex on thinkorswim? Can You Trade Options on thinkorswim? Are you searching for the nonfarm payroll or unemployment figures from the past three months? Perhaps you are looking for the price of gold at the close of yesterday’s U.S. trading session. The search engine makes it easy to find this data in a matter of seconds. You can save and transfer alerts, drawings, and other platform settings between your desktop and mobile devices. This means that you can set an alert or execute a trade at home and monitor the status of the trade while at work or on the commute home. Chat rooms and social media sentiment features allow you to gain insight into what other traders are thinking at any given time. This can help you to confirm your own thoughts about a stock or index or learn why your view may run counter to those of most other market participants. Whether you have questions about how to use the system or how to place an order, someone is available to help on your desktop or on the mobile app. A representative can show you how to change settings, access a feature, or create an order. If you click on the Analyze tab, you will find tools that make it possible to simulate trades and see the odds of a stock reaching your desired price in the future. Under the same tab, it is also possible to determine trade risk and sector exposure. With Level II quotes, you can see the bid/ask spreads being created by multiple market makers on the NASDAQ stock exchange. This data may be used to help you estimate the best price to buy or sell a stock or option. The education center can help you learn more about basic trading strategies and why they may be helpful. You can also learn about how indicators were developed and why they are used. The thinkorswim platform is free to use, and this is true whether you have an account with TD Ameritrade or not. Furthermore, you gain access to updates made to the thinkorswim platform even if you don’t use it to initiate stock, options, or futures trades. In most cases, data is available in real time, but it may be delayed by up to 20 minutes depending on the market. If you would like to use thinkorswim, the first step is to download it to a compatible device. The platform is available on both Windows and Mac computers as well as Apple and Android smartphones and tablets. Those who have the Apple Watch can also make deposits, initiate trades, or analyze data through thinkorswim. TD Ameritrade recommends that users have at least Windows 7 or Mac OS X 10.10+ for best results while using this product on a desktop computer. There is a lot to see and do while on the thinkorswim trading platform. If you aren’t sure where to start, contact support or view one of the many tutorials designed to make your trading journey a little easier. These tutorials are all available on the thinkorswim website, and you can watch them as many times as necessary to get the hang of the various features and tools available through the platform. Customer support is also available to answer any questions that you may have. Trading does involve risk, and it is possible to lose more than your original investment if you trade on margin. Therefore, it is in your best interest to practice as much as possible prior to making live trades. thinkorswim makes it easy to learn how to invest or trade by offering a paperMoney account. paperMoney provides you with $100,000 in virtual margin funds as well as $100,000 in a virtual IRA. While the trades are real, the money being risked is not, which means that it is possible to make mistakes without jeopardizing your finances. When logging into thinkorswim, be sure to click on the Paper Trading tab to use the demo trading feature. 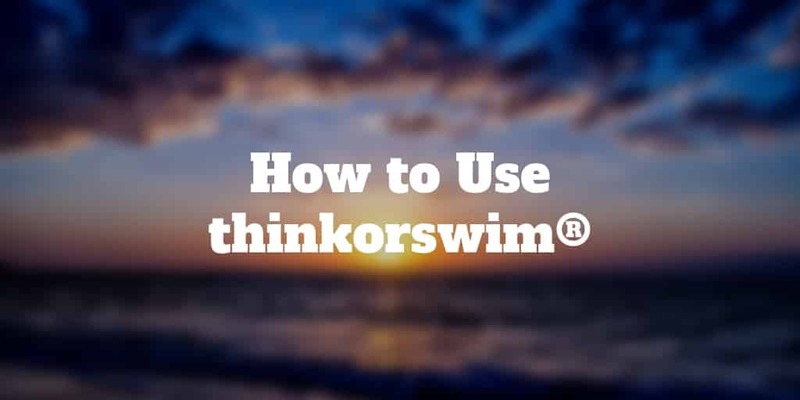 >> Related: Is thinkorswim the Best Options Trading Platform? To use thinkorswim Charts, click on the Charts tab at the top of your screen. Charts are available for stocks, stock indexes, and commodity prices such as oil and gold. You can also find charts that track the price of treasury bonds as well as the VIX, which measures stock market volatility. Charts can be customized in a variety of different ways to meet your needs. For instance, you can track market prices on time frames from one minute all the way up to a week per candle or bar. Drawing tools can help you to visualize significant price levels or take notes right on the chart. Trend lines, boxes, and Fibonacci levels can also be created using the drawing tool. thinkorswim has hundreds of indicators that can be added to charts to help you make sense of recent or long-term price action. These tools can be used to help you time your entry and exit points when making a trade. They can also help you determine if a market is primed for a breakout or is simply testing the top or bottom of a range. To access these indicators, select the Studies tab on the top of the chart. There are thousands of stocks, mutual funds, and ETFs that you could choose to invest in. And thinkorswim has screening tools that make it easier to find investments that meet your criteria. Clicking on the Scan tab will take you to the Stock Hacker and Option Hacker tools. These tools allow you to search for stocks based on price, volume, or any other filter that you choose to add. There is also an Option Spread tool that enables you to calculate potential profits and losses based on the provided trade parameters. Using thinkScript, you can create your own custom studies that can help you make educated trading and investment decisions. Open the Charts tab and then the Studies tab. Click on the Edit Studies tab. Click on New Study, which will open the Script Editor window. To learn more about what is required to create a valid script, visit the thinkorswim Learning Center. Yes, it is possible to trade currencies on thinkorswim. To make a Forex trade, click on the Trade tab at the top of the platform screen. Next, click on the Forex tab to be taken to a list of currency pairs. Finally, click on the currency pair that you would like to buy or sell, as well as the amount that you are prepared to risk. thinkorswim allows you to make trades on common currency pairs such as AUD/USD and EUR/USD. It also facilitates trades of lesser-known pairs such as USD/MXN, which is the dollar against the Mexican peso. Options trading is available on the thinkorswim platform. To initiate an options trade, click on the Trade tab to be taken to the product listing. From there, click the All Products tab to be taken to the Options Trading menu. Once you have reached this section of the platform, you can type in a stock symbol to see its options chain. The options chain features various strike prices as well as the cost to buy or sell an option at that price. In addition to stocks, you can buy and sell stock index options, which are based on derivatives of the indexes themselves. Backtesting is the process of looking at past results to determine if a particular strategy could be effective in the future. There are two commonly used methods that you can use to backtest on thinkorswim. First, you can use tools such as thinkBack to see how a stock performed during a given day, week, or month. It is also possible to use hourly, daily, or weekly candles to get a general overview of how a stock, index, or commodity has traded over a period of weeks, months, or years. thinkorswim is a trading platform designed to provide traders with as much information as they need to make sense of the market. A variety of chart tools makes it easy to find trends or learn more about why a stock or commodity is moving in a particular direction. Those who need help using the platform or executing a trade can access assistance by phone, email, or live chat. The trading community on thinkorswim may also be able to provide insight or answer questions that a beginner or anyone else may have. Tutorials and the paperMoney feature enable users to get comfortable with both the platform and the process of becoming a trader. Backtesting tools can help traders learn from their mistakes or feel more confident that they are making sound choices that can limit risk and enhance gains.